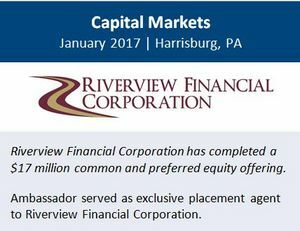 ALLENTOWN, PA--(Marketwired - Jan 23, 2017) - Ambassador Financial Group, Inc. today announced the successful completion of a $17 million private placement of common and preferred equity for Riverview Financial Corporation (OTCQX: RIVE) in which it served as the exclusive placement agent. The offering of common and preferred equity at $10.50 per share closed January 20, 2017. Riverview Financial Corporation, based in Harrisburg, is a Pennsylvania bank holding company and the parent corporation of Riverview Bank, a Pennsylvania state-chartered bank established in 2008 via a merger of equals between FNB Marysville and Halifax National. Riverview stated that it plans to use the additional capital for general corporate purposes, including making loans and strategic acquisitions of bank or wealth management partners if opportunities are present. *Ambassador provided a fairness opinion only. This announcement is for informational purposes only and does not constitute an offer to sell or the solicitation of an offer to buy securities.